The first I ever heard of Dagestan was through a Wikileaks release of a cable from the former US Ambassador to Russia, William Burns, describing a wedding between two very influential Dagestani families. The cable describes a raucous scene, and is one of Wikileaks’ most popular contributions to our knowledge of high level politics in obscure post-Soviet republics. Chechnya’s President Ramzan Kadyrov showed up to the wedding with wads of cash and a gold plated automatic. Tables were piled up with roast lamb and sturgeon. People shot off Kalashnikovs and went jet skiing in the Caspian Sea, one hand on the throttle, and the other gripping a bottle of vodka. It sounded like a great Caucasus party to me, but nothing more. Dagestan to me was just another hard partying, hard fighting republic clinging to Russia’s belly like a drunken honey badger. The fighting has, for most of Dagestan’s history, stayed in the mountains. When the fighting did spill out, it took form as competitive free style wrestling, boxing, or Sambo. But in the past few years a small trickle of professional MMA fighters out of this tiny republic has turned into a steady stream, filling cards from St. Petersburg to Shanghai and across the oceans to Nashville and Jaragua Do Sol. There are at least 50 MMA fighters from Dagestan fighting in promotions across the world right now. Bellator and the UFC have snapped up a few. RUFF in China has a few. M1 and others are also signing guys out of Dagestan. Everyone has noticed by now that this tiny little mountainous republic is pumping out badasses at a disproportionate rate. Jalil has lived in China on and off since he was a kid. His parents did business around the the republics bordering China, and eventually with China as well. He speaks fluent Mandarin and English, and he is in Shanghai to help Azamat Gashimov and Shamil Magomedov, also from Dagestan, get around before their upcoming bouts in RUFF 12 on March 29th. Azamat speaks only a bit of English, and Shamil none at all, so Jalil translates as we talk. 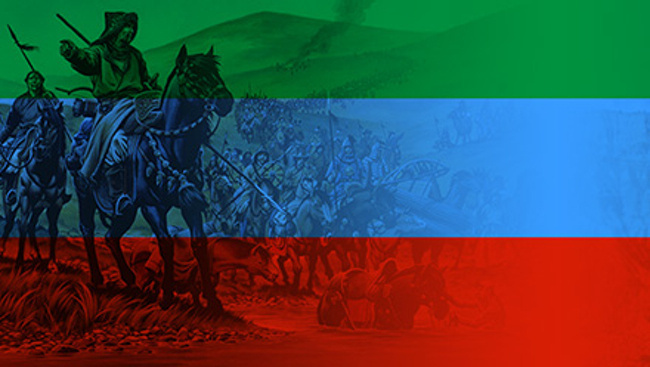 When I ask Azamat why so many fighters are coming out of Dagestan, he goes back to the Caucasian War, between the Russian Empire and an alliance of mountain muslims. Nobody mentions the low level flare-ups between Shia and Sunni Muslims, or between Muslims and Russians, or the botched Chechen invasion of Dagestan back in 1999. Those conflicts are just the tiniest leaves on a tree with roots way, way, way back to ancient times, when the mountain men who lived here fought off the Romans, Persians, Mongols and whoever else showed up. When we turn the discussion to the present day, and MMA, all of the young Dagestani mention Khabib “the Eagle” Nurmagomedov. 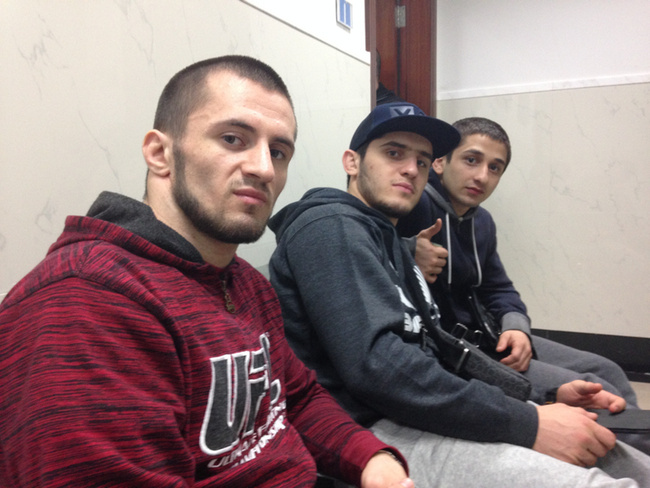 Azamat, Shamil and fellow fighter Islam Makhachev, all trained with Nurmagomedov in Dagestan. They trained with his father too. And when the UFC opened up the bantam and flyweight brackets and began looking for fighters to join Nurmagomedov, Azamat saw his chance. But as with many first-timers in the UFC, Azamat was out of his element. His first ever MMA fight outside of the ex-Soviet Union was in Montreal against Ivan Menjivar, and he lost via armbar in the first round. He also lost his next fight, against Jon Lineker in Brazil, and was subsequently cut. I believe him. Azamat looks driven and perhaps slightly possessed. Between polite and almost shy responses to questions about his fighting history, his family (he just got married last August), and whether or not he likes China, the young Dagestani is murmuring to himself with his head bowed. He, like all of the other Dagestanis in Shanghai for the RUFF event, are devout Muslims. Their Islam is a beautiful Islam, concerned with right thinking and morality, peace and the pursuit of simple happiness. None of these boys display the spittle-mouthed dogma that you find in other parts of this diverse religion. They are quiet and reserved most of the time, or playful with each other at the dinner table. Dinner was a big deal today, because both Shamil and Azamat made weight. We head to 1001 Arabian Nights in Shanghai, and eat a fat dinner of lamb, hummus and pita. Jalil pours hot tea for Kuat Khamitov, a Khazak who is also on the RUFF card tomorrow, and Shamil and his friend Islam take turns poking each other with hot spoons. Everyone takes a break at some point to browse an iPad or an iPhone. Earlier in the day, Islam showed me Jon Jones’ Instagram videos from his trip to Dagestan last winter. The videos show Jones shooting automatic weapons at a shooting range, dancing on a car, and being welcomed by hundreds of young Dagestani boys at a small town on the Caspian Sea. I leave them at Shanghai’s Jiang Wan Hospital, where Azamat and Shamil are getting drips to recuperate after cutting weight. Jalil is telling jokes while his buddy, Ali Pamiri, an ethnic Tajik also living in Beijing, translates snippets for me. They’re like any other group of young men, flipping through their social media feeds and bullshitting. They just happen to belong to a nation of fighters. As I bump fists and walk away, Azamat pulls his hoodie down and I think I see his lips start moving. Maybe he’s praying for the strength to win a big fight. Maybe he’s just praying.